Back in my California days, I always wanted to go see the Sandhill Crane migration. There was an area outside of Modesto where the cranes would come and settle for a while each year during their migratory cycle. A couple of friends were also interested—but we never made it happen. One of the three would always have a conflict—and the other two never got it together to do it anyways, or we’d miss out on the limited reservations for crane viewing. Back there, you had to do Sandhill Cranes by appointment. The cranes are beautiful. They’re a little odd, with a strange whooping type call. I know this because, now, thousands of miles away, the cranes are our neighbors. They live nearby in the cedar swamp between here and the town of Cedar. We can hear their weird yodeling call during the long light of summer evenings. In the late autumn, or early spring, sometimes they’ll fly over to the cornfield adjacent our little apartment, to glean corn bits from the field. It’s funny how something you failed to pursue in one part of life, actually comes to your doorstep later. We don’t get a whole migrating flock. It seems that our cranes stick around for the winter. Maybe they do a short trip south—but if they do, it’s pretty abbreviated, because we see them so frequently here. I think I prefer just a couple of neighbor cranes to some overwhelming migratory flock. It’s certainly more intimate—and doesn’t require a reservation. We are all, each of us, a bundle of talents and deficits. My sweet Rick would be the first to agree; he is continually amazed that a highly functional, over-educated adult, like me, cannot tell left from right, or measure anything with accuracy. The trick is, that for most of us, we focus on the talents we possess. We completely fail at this when the object of our attention becomes a diagnosis, and not a person. A diagnosis can be an opportunity, or an excuse, depending upon how one wields it. In essence, a diagnosis regarding mental capacity gives us information about the nature (and maybe cause) of a deficit. It’s what we do with that information that matters. A couple of decades ago, I worked as a coordinator for an Adult Literacy Program. We banged our heads against this very phenomenon, repeatedly. Students and tutors would blame their failures on learning disabilities diagnosed when the students were children, instead of looking for the work-around. Despite the educational failures of the past, we found that many of our students were highly motivated and, with individualized instructions, were able progress beyond everyone’s expectations. All too often, the diagnosis of a learning disability had quickly become the operative reality—an excuse for failure instead of a challenge for success. I have mentioned in this series that my Uncle Mike was shortchanged by the educational system. He had speech impediments that, unrecognized and unaddressed, led teachers to believe that he was language impaired and uneducable. A second chance in his late teens gave him speech therapy—and language. Not that Mike doesn’t have deficits but, armed with language, he presented a whole new package. Mike moved away before I was an adult, so I didn’t have much opportunity to get to know the “new” Mike, the one who could talk, until many years later. Mike is highly literate. (His keen vision and ability to quickly read signs from a distance were a godsend while traveling with him, across the country.) He reads newspapers and follows current events. He is just as opinionated and informed as the rest of the family—which is saying a lot. He is funny and, in particular, gets situational humor. He has a great memory. But, because his speech is not perfect, many expect him to exhibit lower levels of performance. Mike hides behind these low expectations and, even if it means that he’s misjudged, never puts himself in a position where he will disappoint. Surely, sometimes he fails to “connect the dots,” but I never know if it’s capacity, or training. Mike has spent a lifetime fulfilling his diagnoses. Not that there aren’t deficits. He has great difficulty measuring the motivations of others. Perhaps an early life without language meant that he could hide behind my grandmother’s skirts, and let her do the coping for him. This is especially true when, all too often, in his human interactions he was the victim of bullying and abuse. He doesn’t get arithmetic at all—and is at a total loss with budgeting and money. Beyond that, I’ve decided to judge Mike’s skills by first-hand experience, rather than by maligned expectations. A decade ago Mike and I worked together to set him up in his first apartment. He was thrilled with it, with its humble furnishings and independence. We bought him a modular desk, (IKEA style) that required assembly. I took the lead—never pausing to read the directions. Mike and I chatted as I worked. About half way through, Mike expressed his reservations, “Alta, I don’t think that will work.” I was tempted to press on, but Mike got up off the couch and showed me that part of my assembly was backwards! (Did I mention that spatial skills are not my strong suit?) We both laughed so hard, we cried, and then finished the project, together. Similarly, as we approached the end of our travels, I took a back road shortcut, up a steep hill in Hancock. It’s a winding road—I know it well and I took it at a good clip. We were nearly to the top when Mike cautiously inquired, “Is this a one-way street?” It was, and he was right to question what would have been reckless in two-way traffic. Mike gets it. We have to do a better job of “getting” Mike. The point is, Mike has a far greater understanding about what goes on around him than we give him credit for. His homecoming can be a new beginning, for all of us. We can plan for successes, instead of failures, while providing safe opportunities for success. There are many wonderful possibilities here. Mike is a little intimidated by his return to real winters—but once his health is recovered, I think he will enjoy snow and season. Already, he is recounting childhood memories of winter in a favorable light. There are decided advantages to small town living. My hometown, Copper Harbor, has about one hundred, year-round residents. Already, I am impressed with the welcome. Family members and friends are pulling together to outfit Mike with clothing and necessities for winter living. All of us are making plans for fun and community engagement as soon as Mike is on his feet. This is a seasonal town, if he wants, there are opportunities for work in the summer. My sister told the owners of a local resort that Mike was coming, and when we rolled into town, he was welcomed home, on their marquis! It brought tears to my eyes, and a ready smile to Mike’s face. Finally, we know that he is safe and loved. Finally, Mike has come home. This will require some history. My ex and I purchased the property (that Rick and I are currently developing) over twenty-five years ago. A few years later, an adjacent parcel sold—and the buyers built a house. Ours was empty, so the husband in that duo, Brian, felt free to use our front panhandle as a driving range. He’d practice his golf swing, and send his dog out to collect the golf balls. The dog tired of this, at some point and, apparently, Brian’s version of sport and fitness didn’t include walking, which left our land with a collection of unretrieved golf balls. He’s a nice guy though, and we’d communicate from time to time. He’s a hunter and we gave him permission to hunt on our (otherwise posted) land. Years later, the couple divorced and their house was sold. When Rick and I arrived, we started a collection of those golf balls. We’d find them in the strangest spots. Some partially buried and others, under trees, as much as a couple of hundred yards from where he’d teed up, in his front yard. We’d go for walks on our property, and come back with a pocket full of golf balls, which we tossed into one of the tree cages. We have no interest in golfing. Last year, Brian, who missed the area, bought a lovely parcel just up the road. He’s saving for when he and his new partner can build. In the meantime, he’s hunting there, and has put in a little garden. We go right by his property on one of our regular walking routes. Lately, when we head off to walk that way, we each grab a couple of golf balls, and toss them onto Brian’s driveway, or into his garden. We have no idea whether Brian has, or ever will, notice. Or, if he’ll ever piece it together, in any way—that the golf balls he lost two decades ago are the same ones mysteriously appearing on his new property. But, Rick and I are laughing. I guess that means that we’re well-suited. It’s enough of a joke, just between us. We’ll continue to enjoy our walks, and life’s little pleasures, as we still have a couple of dozen balls left to go. There’s a storm on its way, so I woke at first light, for chores. I wanted to wash and line-dry three loads before the rains came. I don’t think it’s going to be a problem. 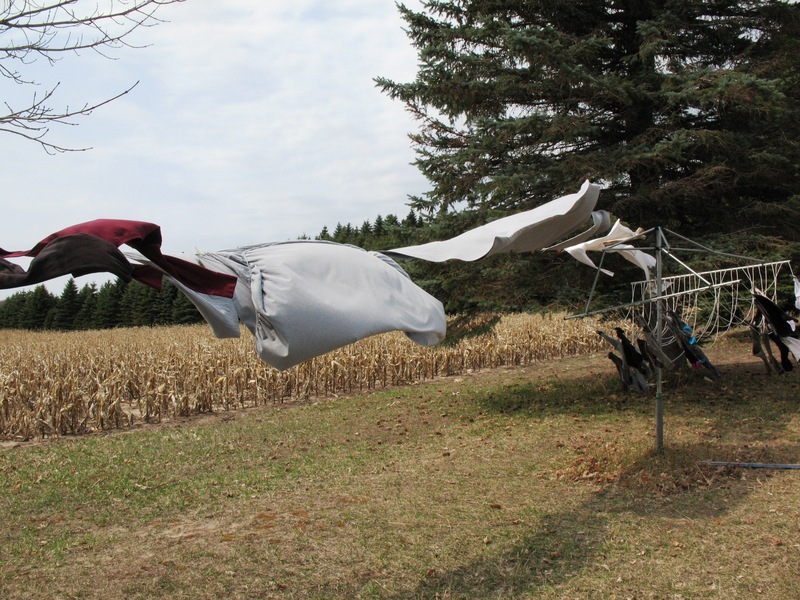 There’s a fierce wind—the one that will bring the storm, and the laundry is hanging horizontal. I don’t think they even make a clothes dryer that works as fast as this. A wind this strong actually shakes out the lint, and leaves even line-dried clothes as soft as a machine-tumbled load. 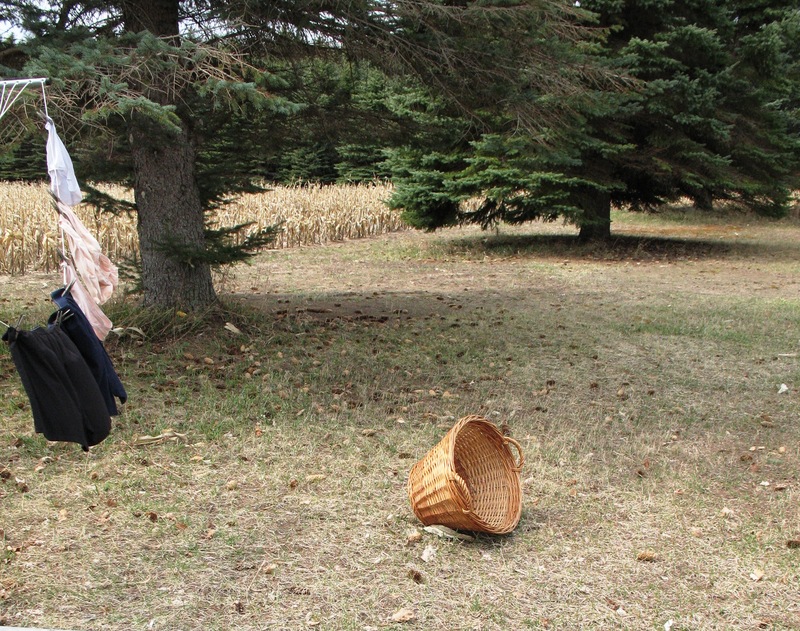 As soon as my basket was empty, even while I was still wrestling to pin the last item, off it went, rolling in the wind. Last year’s standing corn plants, in the field next to our clothesline, make quite a racket, rustling in a wind like that. There it goes in the wind! I’m glad for the weather, though. A good wind can blow out the cobwebs, literally and figuratively. Admittedly, I’ve been in a funk. We’ve been hiking in the woods quite a bit of late, and doing some unexpected detective work. You see, we’ve been finding cut logs and stumps. Someone has been cutting wood on our property. This breaks all the rules. In the world of making wood, there is no need to cut live trees for firewood. With weather and wind and blights, there’s always plenty of dead wood (or “deadfall”) to forage. Gathering deadfall cleans up the forest—and gives you a head start on seasoning the wood, for burning. 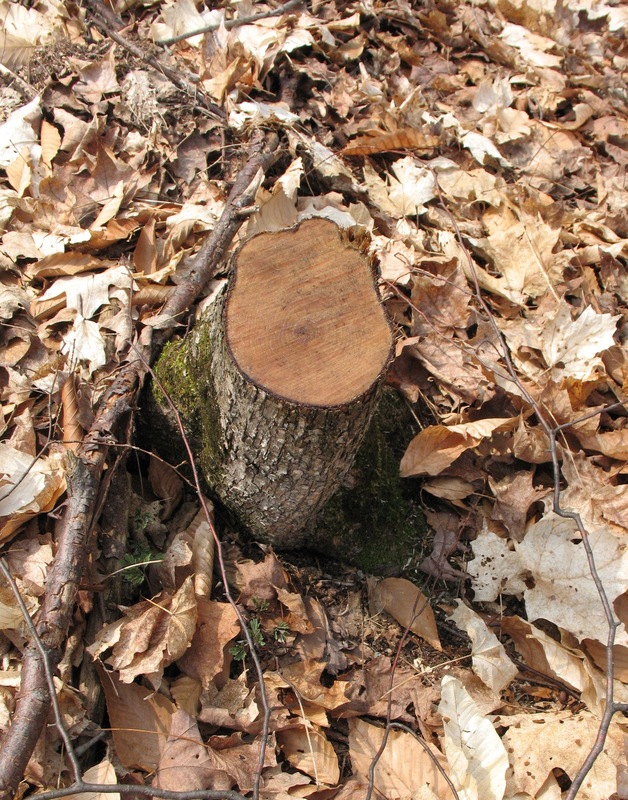 Cutting live trees is reserved for timber cutting, either as a harvest, or to thin the forest. We did a “thinning” harvest 11 years ago. Now, with the emerald ash borer damage, we have no further need to thin the forest. This property has been without stewards for a couple decades. Vacant land is often considered ‘fair game’ in rural areas—at least for gathering. Last Spring we politely disinvited some locals from morel mushroom hunting on our hills. There’s a longer story there, but basically, they were put out that we’d returned to the land—a gathering zone that they’d considered theirs, for decades. I do understand; I have my own secret berry patches in the woods where I grew up. I don’t own them, but I am proprietary about not revealing my sources. Had these ‘locals’ not been outright abusive in years past, I might have invited them to keep up their tradition. Vacant land is also a source of deadfall gathering. I know that, in our absence, at least three neighbors had fuelled their winter heat from our slopes. It was fine. They kept trails clear and didn’t (for the most part) abuse the privilege. But, we’re here now. A few faces fell when, otherwise friendly neighbors, realized what our return meant. You see, they follow the code. One might gather from vacant land, but you don’t harvest from your neighbor’s land. Even without fences, there are boundaries. We’d been finding cut logs for several weeks. They were pretty consistent, six to eight feet long, saw cut, top and bottom, five to six inches in diameter. An easy size to carry, and one that can be burned later, needing only to be cut to stove size, but not split. They littered our walking paths. In total, I’ve tallied (and collected) well over thirty such logs. And I’m sure I’ll find more. It seems that ‘they’ cut each year, and then the following year, when hunting season came, they’d collect the seasoned logs for burning. This annoys me, no end. 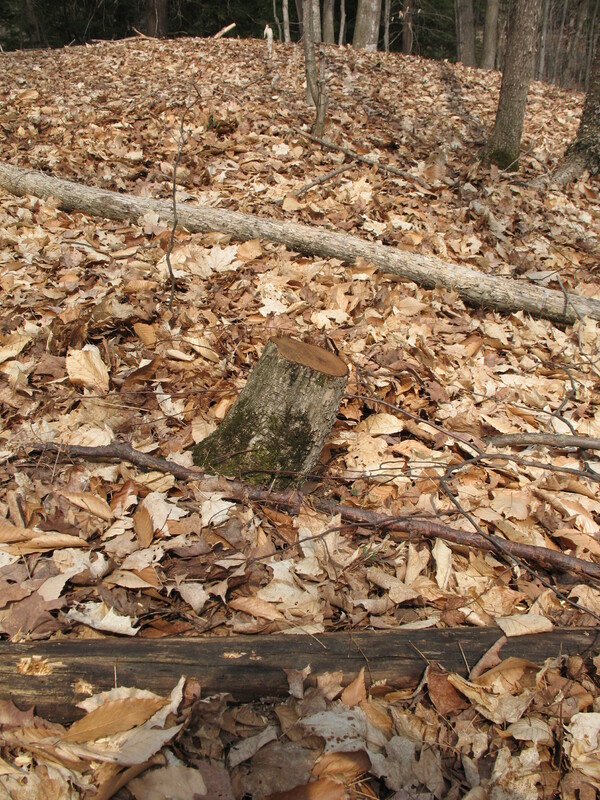 We assume that these logs were left by the same “locals,” who were collecting the mushrooms last spring. They used to own the parcel behind us and had a deer-camp cabin there. It seems likely that they used our firewood to heat the cabin in deer season. As they’ve since sold the property, we figured that the wood-cutting would end, too. There’s no sense in being angry at a theft that’s past, and incomplete at that. Lest you think that I’m just a wood miser, I’m angry mostly because of the way that this was done. With a forest rife with available deadfall, these jokers saw fit to cut living, young trees—for their convenience. Whether they wanted them for firewood, or for posts, doesn’t matter. And, they’ve cut slow growing hardwoods—maples and eastern hophornbeam. The hophornbeam is a tall, elegant tree of the understory of the forest. They have thin, shaggy-barked trunks; a hophornbeam’s trunk is rarely thicker than 9 inches. They like the shade of north-facing slopes. The thieves are stealing wood and damaging the forest. It’s like killing a generation of children. How can that gap be filled? Rick and I are already buying and planting trees from the Conservation District—an effort to fill in and diversify the forest following the Ash Borers’ losses. We expect to plant 50 to 80 trees per year and that’s just the beginning. There are right ways and wrong ways to manage a woodlot. What they have done is wrong in so many ways… in every way. Yesterday we were out for a walk and I saw yet another stump. This one was weeping, literally. It means that it’s a recent cut. We dug about in the leaf litter, and, sure enough, found fresh chips and sawdust. The tree was cut last fall, we guess—just before the leaves fell. Now, with the spring sap running, the tree’s roots are trying to feed the treetop that has been taken. So, our problem is ongoing. I am sick about it. It was an eastern hophornbeam (also known as ironwood because it’s so hard.) They are very slow growing—they don’t even flower or make seeds for the first twenty-five years. Though I’m happy to harvest their deadfall, (because they’ll burn all night) I would never cut a living hophornbeam. And right next to it, a deadfall tree of the exact same type. Rick and I don’t know what to do. We don’t want to post “No Trespassing” signs on the property. We have a number of neighbors who hike, snowshoe and ski its trails. We have no issue with respectful use. We like sharing its beauty. But, if I catch someone in the act of cutting, I will see to it that they are fully prosecuted. Michigan is a logging state, and they take timber theft seriously. When I say this, Rick raises his brow at me, wondering at my vehemence. We both hope that this is not one of our neighbors, but the chances are high that it is. This evening, we’re waiting for the storm. It may clear my head. The whole week is expected to be unsettled—cool weather with the possibility of snow. Right now, the only rustlin’ I want to hear about, is the wind in the trees.